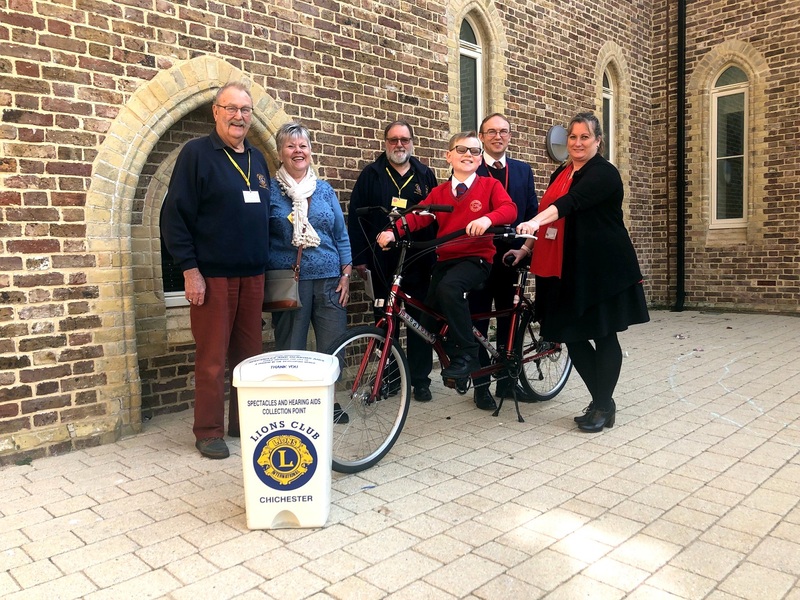 Chichester Lions Club has presented a special bicycle to a young, visually impaired lad at Chichester Free School. Leo comes from a cycling family but his visual impairment meant that he was not able to fully join in the family’s favourite past-time. Now he can be at the front of the peloton experiencing all the joys of cycling. The bicycle, a Buddy Bike from Florida in the US, is a tandem specially designed to place the smaller rider in the front seat while the rear rider controls the steering. It has a lower front seat so both riders can safely enjoy the view and is shorter in length than a typical tandem, making it easier to manoeuvre. Leo was also able to choose the colour of the bike and he selected his favourite colour, red. The new bike, which was presented during school assembly, will offer Leo outdoor recreation and therapeutic activity with his family. Staff at Chichester Free School identified Leo’s needs and wanted to help him develop his skills so they approached Chichester Lions for help. Peter Wilson, from Chichester Lions, said: “Monies raised for this tandem came from our sight project. Lions in Chichester collect old glasses then sort them to sell readers and sunglasses as well as donating useable pairs to countries where they are needed. Some glasses have precious metals which are recovered with all the income going to help sight-related charities and individuals.